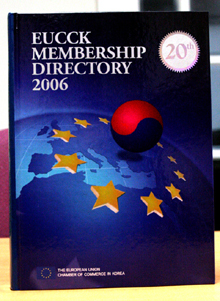 The European Union Chamber of Commerce in Korea (EUCCK, http://www.eucck.org) has just published "EUCCK Membership Directory 2006" with the information of more than 700 European companies, 25 embassies, national chambers of commerce, trade associations, schools, culture centers, and investment centers. This 800-page "Fact Book" contains details of almost all the European companies in Korea and provides the most updated information on EUCCK members. The directory includes details of 650 members in the Seoul area and of 100 members in Busan/Gyeongsang province. Each page contains the addresses of the head office and branch office in Korea, line of business, activities, number of employees, and contacts of all the EUCCK members. Also included is, a useful Investment Guide to major metropolitan cities and provinces. The directory is useful not only for domestic companies wanting to do business with European companies, but also for local government organizations who want to invite foreign investment, job seekers, and every government department. Moreover, EUCCK is also providing an electronic format - a CD-Rom - which contains Hyperlink to members' homepages as well as the same information available in the print version of the directory. For further details contact: Senior Editor Ram Garikipati Tel: 82-2-725-9916/ Manager Cho Sung-ho Tel: 82-2- 725-9915.